A Mystery Revisited A building that figured in the unsolved death of actress Thelma Todd is for sale. The main stairway and entry to the Pacific Palisades property that has been put on the market by Paulist Productions. They found actress Thelma Todd's lifeless body on the morning of Dec. 16, 1935, slumped over in the front seat of her chocolate-colored 1934 Lincoln Phaeton convertible, her car parked in a two-car garage near her married lover's brooding cliff-side mansion in Pacific Palisades. She was dressed in a mauve and silver evening gown, expensive mink wrap and adorned with a small fortune in jewelry, after attending a party in her honor into the wee hours of the morning with her Hollywood friends at the famed Trocadero nightclub on Sunset Boulevard. The death of the blond, wisecracking comedian dubbed "Hot Toddy" who had appeared in more than 40 films, including "Horse Feathers" and "Monkey Business" opposite the Marx Brothers, would unleash a media frenzy rivaling the O.J. Simpson case six decades later and spawn endless theories over what led to the 30-year-old starlet's untimely demise. Now, a piece of this Raymond Chandler-like mystery is up for sale, and, from the looks of it, the public's appetite for the long-simmering Hollywood scandal has not abated. Just down the hill from the death scene in the Castellammare section of Pacific Palisades, a sprawling, three-tiered Spanish-style building that housed Todd's swank ocean-view apartment in the 1930s went on the market this month for the first time in decades. The asking price: $4.7 million. The salesman handling the property said he has been deluged with phone calls from prospective buyers, many of them local residents, who are entranced as much by Todd lore as they are by the rare opportunity of buying a prime piece of commercially zoned real estate on Pacific Coast Highway that goes for $300 a square foot. "The first day my sign went up, I had 75 phone calls within six hours," recalled Rene Soto of Les Small & Co., a real estate consulting firm in Century City. "I'm averaging about 50 calls a day." Soto noted that prospective buyers are not just asking him about the building, they want to hear the Thelma Todd saga. Like other scandals from Hollywood's early days, from "Fatty" Arbuckle to William Desmond Taylor, the strange death of Todd was a tale filled with glamour, intrigue and enough colorful characters to populate a novel. Was she murdered by her business partner and sometime lover, a fading screen director and producer named Roland West? Was she followed home from the Trocadero that night by her abusive ex-husband, Pat De Cicco? Did gangland boss Charles "Lucky" Luciano order his boys to rub her out after she allegedly balked at allowing casino gambling above her restaurant? Or, was it all just a tragic accident? 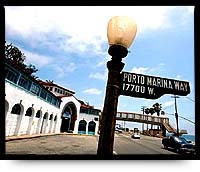 The three-story, 15,000-square-foot building in which Todd once lived is only a pedestrian bridge away from the beach at 17575 Pacific Coast Highway--a familiar sight to thousands of motorists who zip along daily between Santa Monica and Malibu. Using the actress' fame as a draw, West and Todd opened a popular restaurant on the ground floor of the building called Thelma Todd's Sidewalk Café. One floor up was their private nightclub named Joya's, which played host to Hollywood's rich and famous. Given its flashy history, then, it is no small irony that today the building is owned by a religiously oriented motion picture and television production company called Paulist Productions. Thelma Todd, in costume for a film, in an undated photo with Pat De Cicco. Wide World Photos Founded in the 1960s by a much-beloved Catholic priest, the late Father Ellwood E. "Bud" Kieser, Paulist Productions came to prominence in Hollywood for its award-winning television series "Insight." How the production company acquired the property has a Todd connection. The owner, Lola Lane of the singing Lane sisters, had married Roland West and inherited the building after his death in 1952. She remarried and, after converting to Catholicism, she and her husband met Kieser and were so impressed that they invited him to set up shop on the ground floor of their large residence. The property was later deeded to Paulist Productions. Today, officials at Paulist Productions say it just doesn't make sense for the production company not to utilize the money that can be realized from selling the property. "This is an asset," said Father Frank Desiderio, a Catholic priest who heads Paulist Productions, "and we've been sitting on it rather than putting it to work." Just touring the building is nostalgic. Desiderio points to a frayed menu from Todd's eatery that is framed and mounted on his office wall. Among the menu offerings: Gin Fizz--35 cents, Thelma Todd Knockout--$1, Thelma Todd Milk Punch (gin base)--45 cents, and a Thelma Todd Rickey--45 cents. "A hot weather suggestion." The current lobby of Paulist Productions is reached by ascending a grand staircase, and up a small, winding stairway is a hexagon-shaped, third-floor ballroom that in Todd's heyday had a dance floor and bandstand but now serves as living quarters. Because the building has such a rich history, Father Desiderio has become well-versed in the Todd mystery, although he does not hold himself out as an expert on the case. "She was a magnet," he said. "She would bring people in. She was a huge star. But because she also liked to go out, there were some nights she wasn't here, which would drive Roland West up the wall. He would say, 'You're my moneymaker, and if you're not here, I'm not making money.'" Desiderio then leads a visitor along a dirt path behind the property to the old West mansion, still as stately and ominous-looking as ever. The garage in which Todd died is still here too. On the night before her death, Todd had gone to the Trocadero, where a party in her honor was thrown by British actor Stanley Lupino, the father of then-ingénue Ida Lupino, who was one of Todd's close friends. Along with the Lupinos, other guests that night included theater mogul Sid Grauman, movie choreographer Arthur Prince and theatrical agent Al Kaufman. Todd left the Trocadero about 3 a.m. in a car driven by a chauffeur, arriving at the cafe about 3:45 a.m. Police theorized that after the chauffeur left, she discovered the door to the cafe locked and walked up a long flight of steps to West's house. But some of those familiar with the case challenge the notion that Todd, who had recently been diagnosed with a heart ailment, would have walked up the steep flight of steps to West's garage. She could have gone into the garage, located at 17531 Posetano Road, climbed into her car, and turned on the ignition to warm herself from the cold wind that blew over the Palisades that night, authorities speculated. But critics of the police version note that she was a bright, former schoolteacher and would have been well aware of the dangers of carbon monoxide. Her maid, Mae Whitehead, discovered the body. Todd's skin was crimson, a telltale sign of carbon monoxide poisoning. The coroner believed that coagulated blood found around her face, on her dress and inside the car had been caused when her head struck the steering wheel. There was no sign of a struggle. Randy Young, a local historian who interviewed Castellammare residents who were around in the mid-'30s, said he believes the actress was murdered by her sometime lover, West, who then covered up the crime. "We knew the gentleman who was a service station operator and jack-of-all-trades in the Palisades," Young said. "He was the first one on the scene before the police came. He saw she was hit in the head. He said there was a lot of blood on her. She had not fallen on the steering wheel and hit her head. She was in the passenger seat and was kind of leaning over." Film historian Marc Wanamaker, who knew the late Hollywood producer Hal Roach, a close friend of Todd's in the early days of Hollywood, posits the theory that Todd wasn't murdered, but that West was responsible for her death. "I believe, and Roach confirmed, that she went out to this party on Saturday night," Wanamaker said. "Upon leaving the house to go to the party, there was an argument between her and Roland West [that she be back by 2 a.m.]. ... When she came back around 4 in the morning, he wouldn't let her into the house. "I believe West ran after her down there, she turned on the ignition, and he shut the door to the garage so she wouldn't leave," Wanamaker added. "I don't believe he knew what carbon monoxide was. It wasn't suicide or murder. It was manslaughter on his part." Because of the tantalizing story behind the building, locals don't want to see the stylish building on Pacific Coast Highway where Todd lived and played fall victim to the bulldozer once it is sold. "If somebody buys it and wants to tear it down, we would fight and have it 'landmarked,'" said Lorraine Oshins, president of the Pacific Palisades Historical Society. As for the Todd case, the mystery shows no sign of evaporating. Young noted that mystery writer Raymond Chandler had lived in the Palisades and knew the Todd story and the terrain well. "He took a lot of what was out here," Young said, "and wrote them into his novels."